If one writes things, occasional slip-ups creep in. In this case, an unchallenged assertion of who is “first” drew this kind email from Klaus Savier, builder, tuner and pilot of a very slippery Long-Eze. He’s flown from California to Florida and back on good old fossil fuels (with one fuel stop each way) in his highly modified Long-Eze and achieved 30 miles per gallon at 250 miles per hour true airspeed. It would be interesting to see how little fuel the airplane would consume at Green Flight Challenge airspeeds. His demonstrated 0.36 pounds of fuel per horsepower-hour is claimed by Klaus to be 40-percent lower than the commonly seen 0.60 pounds per horsepower-hour that engines without his Light Speed Engineering ignition system and more standard propellers manage. It shows what a determined experimenter can accomplish. Thank you for the nice article you wrote in Kitplanes a while ago. So far that was the only publication of actual demonstrated performance of this machine. As most articles process hyperbole and fantasies these days, it was welcomed by many readers and I saw many quotes from that article on various experimental aircraft blogs. There are still a lot of readers who prefer facts over fantasy even though our reality can hardly compete with a good dream. I am continually improving the airplane, there is a lot more to come and the performance has been advanced significantly already and the weight has been reduced further. You might have seen that I won the Bronze race at Reno this year, another Long EZ with a very special, much larger engine, turning 300 rpm more was 35 mph slower. As an engineer [a technical writer – or technically, a writer, actually], you know what that entails. But that brings me to another point: They had only one trophy for first in the bronze. The guy behind me got second place. He received his own trophy for placing second. That is the way it works. Once there is a “first”, there can’t be another first for the same claim! “For 50,000 euros ($62,000), these future ‘StratosVoyagers’ will live a unique experience, they will be the first passengers of a solar airplane.” We know that this can’t be true! At best, they will be the 50th or something like that since you and I know that Eric has already flown more than a dozen passengers in his Duo. 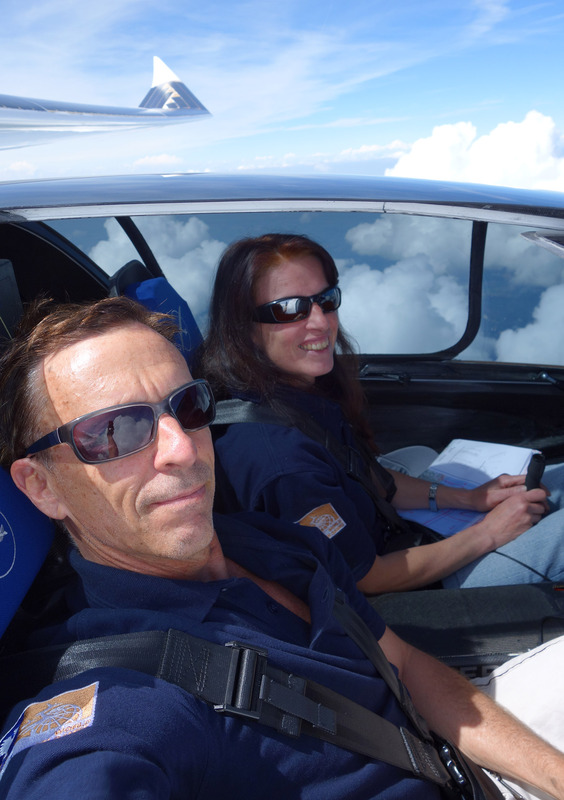 Although Irena Raymond may not be the very first passenger in the Sunseeker Duo, she has gone on to solo the solar airplane she and Eric built together. They are definitely the first family of solar aviation. Your editor appreciates the gentle nudge from readers like Klaus, and will attempt to be sharper with editorial discretion. In the meantime, we can only appreciate and encourage all seekers of greener flight.